At SoleScience, we believe that proper foot orthotics are an important factor in maintaining proper foot health. 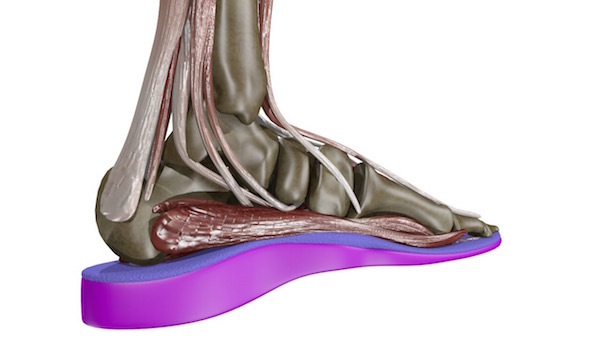 We are believers of the Soft Tissue Stress theory; when we create our custom orthotics for our clients, our goal is to reduce the tissue stress to tolerable levels and not simply to “properly align your feet”. In fact, there is no such alignment that exists. That means that we strategically start your treatment with less foot support and gradually build in the support you need in your orthotics only if you require it. This way, we can get you back on your feet without needlessly depending on additional support. SoleScience custom orthotics stand above the rest and are some of the most comfortable devices available. Our research has allowed us to develop a simple tool that assesses comfort because we believe that orthotics should never be uncomfortable. With our Comfort Guarantee, we will ensure that you love your new custom foot orthotics, if not, we will gladly adjust them until you do. “I have been a patient for about 4 months. My first pair of orthotics needed adjustment. Immediately my pedorthist put another plan in motion to use different materials in my orthotics. This is the first time in over a decade that I feel confident that I have found someone who will do everything in their power to help relieve my pain. How Do You Know if You Need Custom Orthotics? In this case, you will feel better wearing the orthotics than not wearing them. Such is the case in people who suffer from various types of arthritis (osteo or rheumatoid), Morton’s neuroma, metatarsalgia, tibialis posterior tendon dysfunction, or a movement disorder. In this case, we use the foot orthotics as a tool to restore your ability, then try and taper you off. The Canadian Certified Pedorthists at SoleScience don’t believe in keeping you in any type of orthotic needlessly. We will work with you to decide on an appropriate course of action. Your individual treatment plan may include specific stretching and strengthening programs (or referrals to physiotherapy), icing, footwear education or recommendations, and some form of foot orthoses all determined by gait analysis using our GAiT profile testing. If you don’t need orthoses, we will provide you with alternative options. We know that education is crucial to getting you back on your feet and will make sure you understand everything, every step of the way. Do you suffer from tired legs due to hours spent standing or sitting, or are you experiencing more serious problems like swelling, varicose veins and venous disease? Reduce leg pain by improving blood flow and reducing swelling with the use of compression socks & stockings. SoleScience can fit men and women of all sizes with compression stockings made to meet your specific needs. We also provide compression socks that aid in the pain caused by bunions. Talk to the SoleScience team to find out if compression socks and stockings are right for you. If you have been diagnosed with Medial Knee Osteoarthritis (pain from arthritis on the inside of the knee), a custom-made foot orthotic may enhance the function of a custom brace. These two work together to lessen the impact on the arthritic joint, allowing you to do more, with less pain. Read more about the effects of the combination of custom orthotics and bracing on our research page. This research was a collaboration of SoleScience and the Wolf Orthopaedic and Biomechanics lab at Western University. For more information about custom orthotics, contact our team of professional pedorthists to find out which treatment options are right for you.